This operation manual is designed for specialized and qualified personnel. It comes completes with diagrams and all the documentation necessary to lift, move and place the machine and instructions for the safe use and maintenance. All information contained in here is accurate at the time of print. However, our company reserves the rights to modify and improve specifications without prior notice. 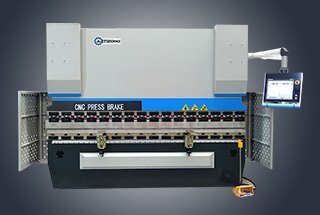 The press brake should be properly installed as instructed; regular inspection and faithful maintenance service should be carried out so that good performance can be maintained. Any incorrect and irresponsible usages may cause irreparable damage to the machine and nullify the safety protection for the operator. We do not assume any responsibility for improper services or modifications or connections made by unauthorized personnel. 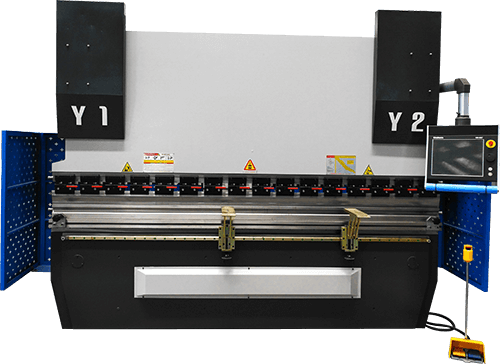 1.1 This press brake is high-efficiency and high-precision in bending metal sheet. 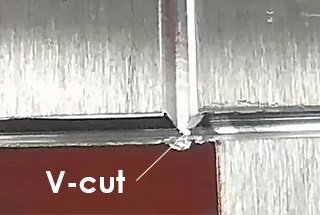 The opening size of V-groove on lower dies is usually 8 times larger than the sheet thickness, it should be regulated for sheets in different thickness. 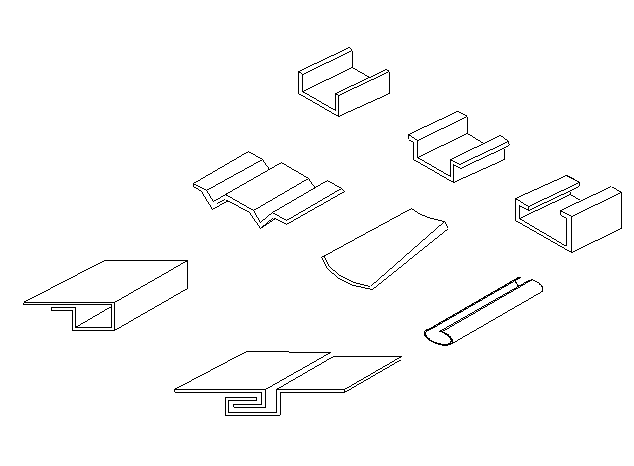 Using different kinds of upper and lower dies can bend many kinds of workpieces (See Fig.1). 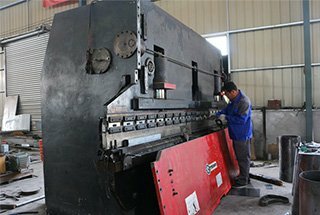 1.2 The press brake is structured in steel plate fabrication with sufficient strength and rigidity. 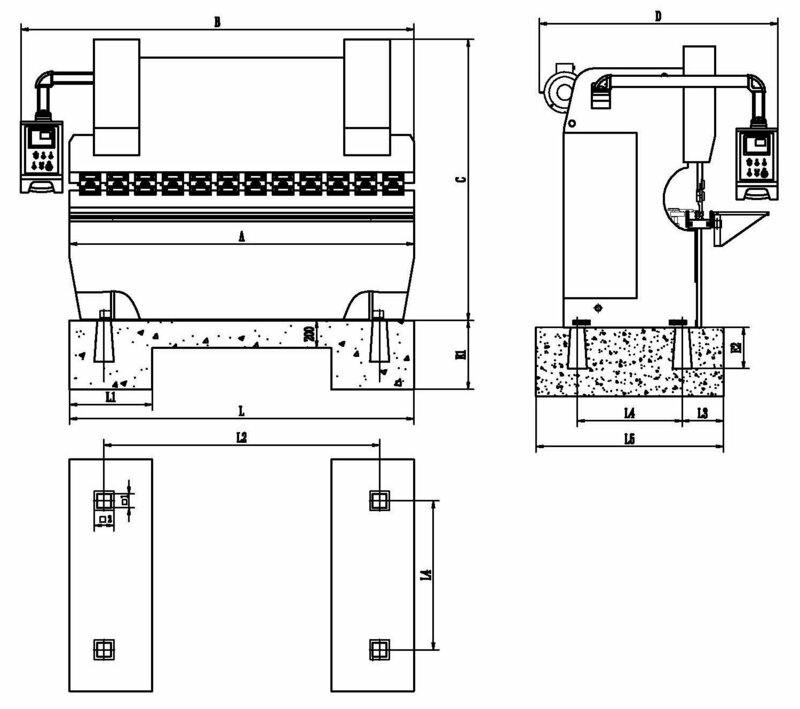 The hydraulic drive prevents the machine from serious overload operation accidents caused by the change of sheet thickness or bad choice of the lower die cavity. Additionally, this machine is also featured by the steadiness of work, convenience of operation, and reliable safety. 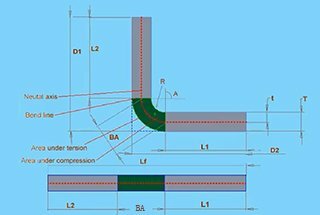 The connecting section to the upper die is provided with a compensation device, which compensates the deflection of worktable and slider in bending and guarantees the high work precision. Meanwhile, the mechanic block is equipped with the oil cylinder to ensure the fixing accuracy when the slider travels to the bottom dead point and so as to assure the consistency of bending angle in bulking production. 1.3 It is equipped with hydraulic electric control, freely adjustable slider travels and inch operating criterion convenient for module trial and adjustment. 1.4 This press brake is advanced in technology and reliable in performance, and among the ideal shaping apparatuses. It is widely used in the plane, automobile, shipbuilding, and machine with high production efficiency. Keep far away from powerful vibration and electromagnetic interference. No pernicious and corrosiveness gas, and no dust. 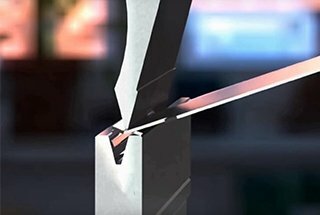 It must be ensured that when lifting the press brake for transportation and/or positioning it must be done with the crane which having sufficient lifting capacity so that there will be no risk of the press brake falling. 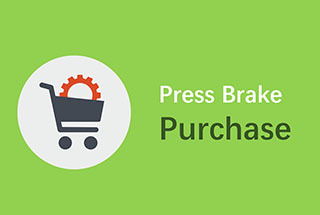 When transporting the press-brake, keep in mind that the weight of the machine is concentrated mainly in the front. 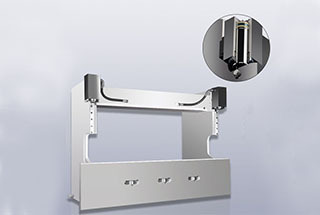 Ensure that the top ram of the press-brake is all the way down for maneuvers or transportation. When the press brake is to be load onto the truck, the rear side of the machine is position as far as possible to the side of the vehicle. The press brake is to be anchored to the truck using steel rope. To ensure that the press brake machine works correctly and is not disturbed by vibrations, please check and confirm the pavement is firm and steady. Prepare a concrete foundation, which must be adapted to the conditions of the ground, if necessary. Ensure that there must be adequate space surrounding the machine once positioning. This is necessary to cater for maintenance work and special jobs. 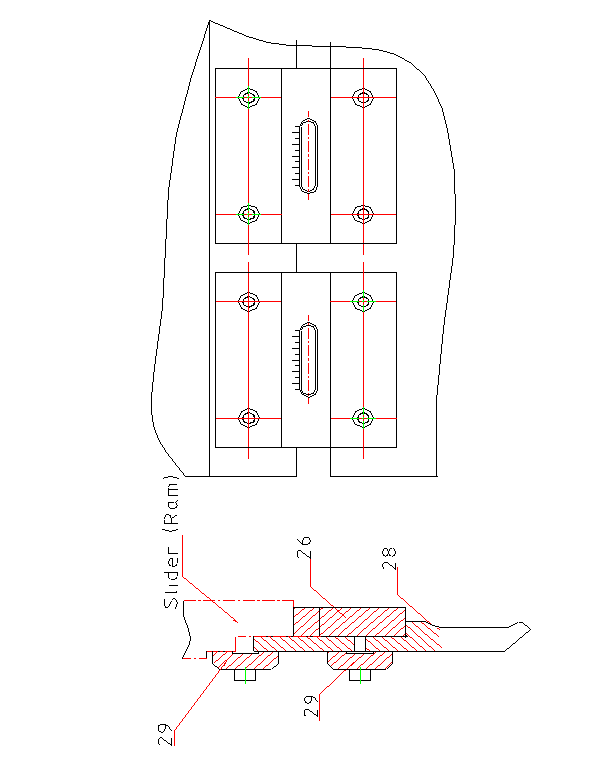 Furthermore, an adequate space on either the left or right side of the press brake equals to the length of the machine to cater for tool changing operation. All exposed surfaces of the machine are coated with rust guard, easily removable by kerosene or solvent. For the press brake to function correctly, it is necessary to ensure that the machine is leveled correctly. Check that the press brake is level horizontally by placing the spirit level on the machine table. Check that the press brake is level vertically by placing the spirit level on the machine table. Eventual adjustments are done by regulating the leveling bolts in the feet of the press brake. 3.1 The following steps are to be cared for by the owner and must be carried out by specialized personnel. Check the machine nameplate and confirm that the wiring of the press brake is in good condition. Connect to the available power in your facility. If the required power does not meet the requirement of the machine please contact your electrical supplier. 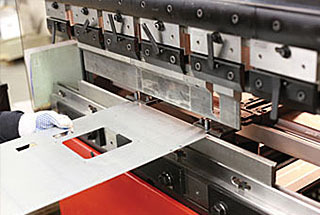 The power incoming to the press brake machine should be fused so that the machine can be fully disconnected for repair. 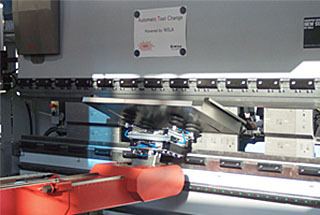 The power incoming to the press brake machine should be connected to the RST clamps in the control cabinet. 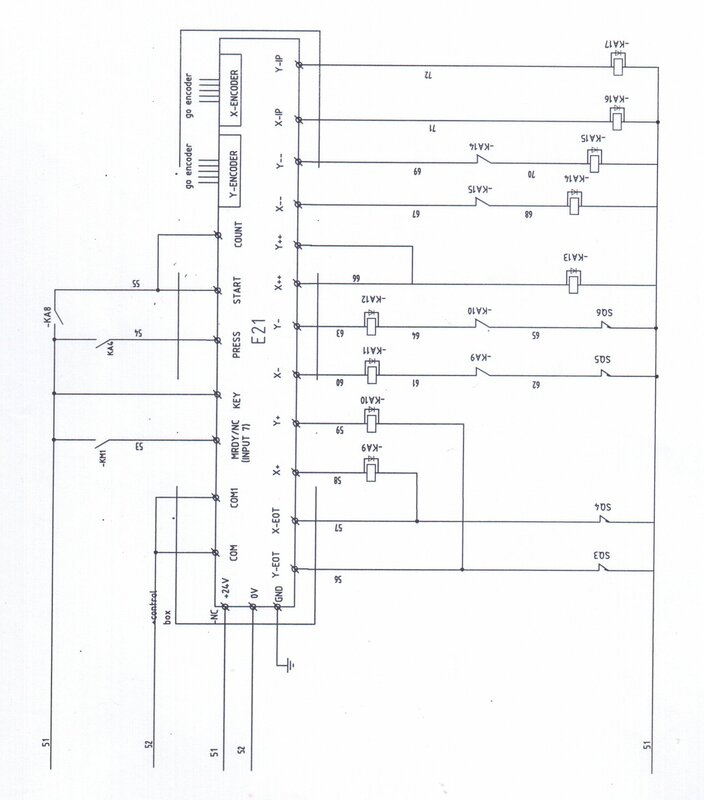 The Electric drawings can be checked by the following attachments, the different controller has different drawings. Connect the three-phase power lines to the inlet terminals in the electric box. 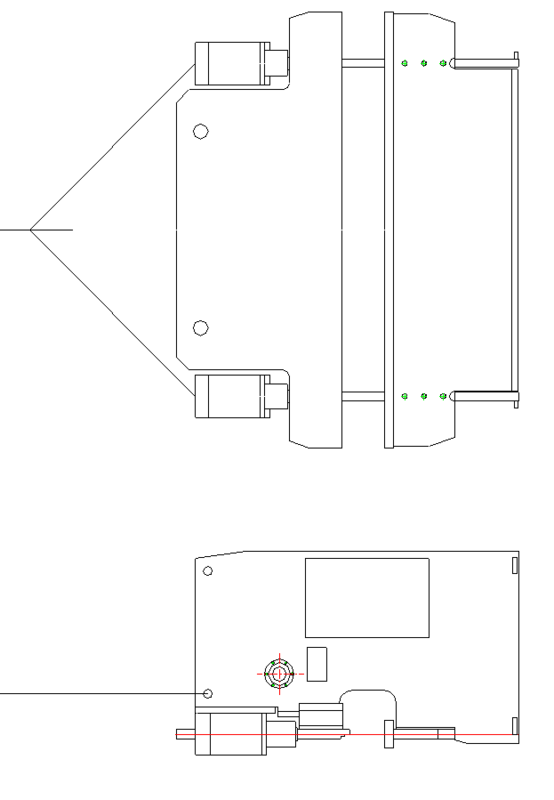 The feet switch socket is under the box, plug the socket, then close the power switch QF and close the door of the electric box, the lamp HL1 is lighting shows the machine is powered on. 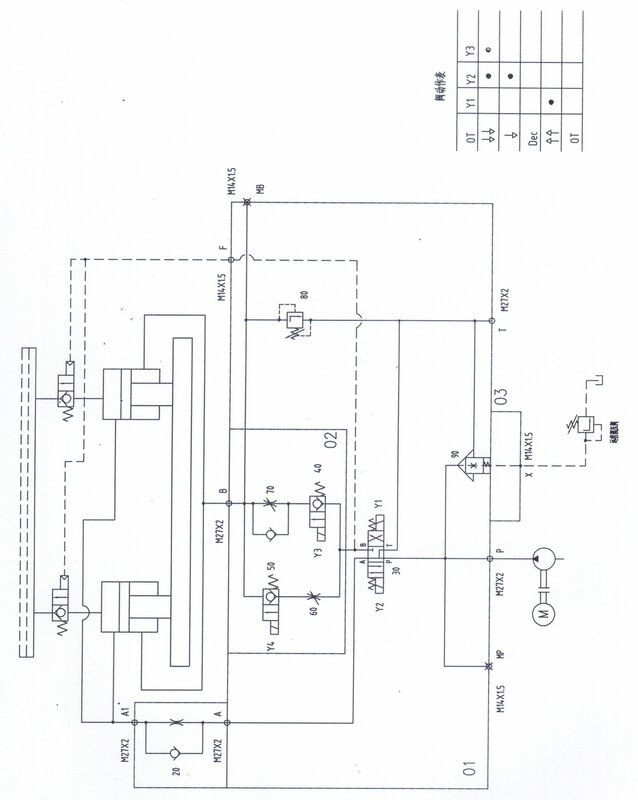 Start the oil pump motor button HL2 on the operation panel for a short while; observe the turning direction of the motor whether the direction it is correct or not. If it’s not correct, change the phase of the inlet lines, never change the internal lines inside the electric box, then start the oil pump motor. Jog mode: after several minutes of normal operation, turn SA2 to the jog mode, step the foot switch “up”: the ram goes up, loosen foot switch the slider stops, continue to raise the ram up when touch the limit switch SQ1 will stop; step “down”, the ram quickly drops, due to the effect of the limit switch SQ2, the ram goes down slowly to add pressure, loosen the foot switch ram will stop. Single travel mode: turn SA2 to “single time”, step “down” of the foot switch, the ram goes down first quickly—slowly—pressure keeping, then the ram automatically goes up to the upper limit switch SQ1. Adjust the working time of time relay KT1, make the working time meet the requirement of bending pressure on the workpiece, adjust the pressure-keeping time of time relay KT2. Continuity mode: turn the SA2 to “continuity”, step the foot switches for repeating the single travel mode. The time relay KT1 may adjust the waiting time of circulation. 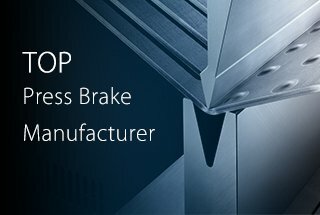 Note: To guarantee the safety, press brake machines with CE certificate without continuity mode. The hydraulic system has a high requirement for the cleanliness of hydraulic oil. The clean of the oil tank is very important. When replacing the hydraulic oil, you must discharge the cover of the oil tank. Use the towel to clean the bottom of the tank (do not use cotton yarn), then wash with cleaning coal oil gasoline. For the limitation of tank cover, the arm cannot reach the end of the tank; you can wrap the towel on the bamboo or stick to wipe each corner. 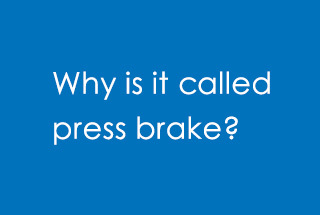 Loosen the leaking plug or brake valve to leak out the dirty oil. Use the cleaning towel to dry the sides and bottom of the tank until it’s clean. If necessary, roll the dough at the welding seam or difficult cleaning places to cling the dirt, and then put on the cover. The mark value of hydraulic oil is equal to the average value of viscosity when the temperature is 40℃. If the working pressure and temperature of the hydraulic system are higher, and the working speeds slower, then chose the hydraulic oil with a higher grade. It is recommended to use antiwar hydraulic oil ISO VG46# (the average value of viscosity is 46mm2/s when the temperature is 40℃.). If the machine operates under 5℃ for a long period, you can choose hydraulic oil ISO VG32#. It is also recommended not to use the machine at very low temperatures (below -5°). However, should this occur, and then let the machine run idle for a while. An oil heater can be fitted in the circuit if required. Under the normal working conditions, the oil temperature must not exceed 70C. 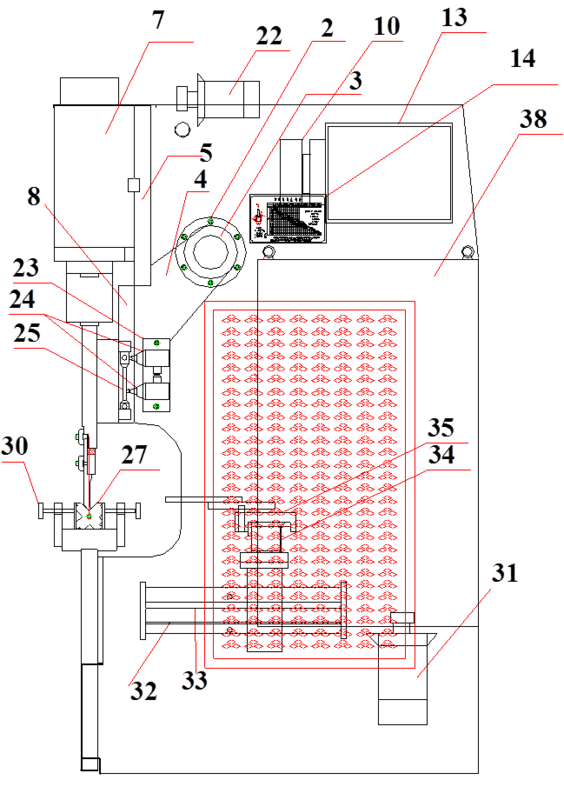 Under special conditions, the oil cooler can be installed if necessary. The using oil must be clean. Screw the nut of air filter, filling through the air filter. If using the filling equipment with filter, you can open the cover of oil tank and fill directly. Observe the oil gauge, when ram stops at Top Dead Spot, the hydraulic oil fills at about 80~90% of the inner spaces. Make the machine work, first idling then at the maximum stroke to expel any air bubbles in the hydraulic circuit. 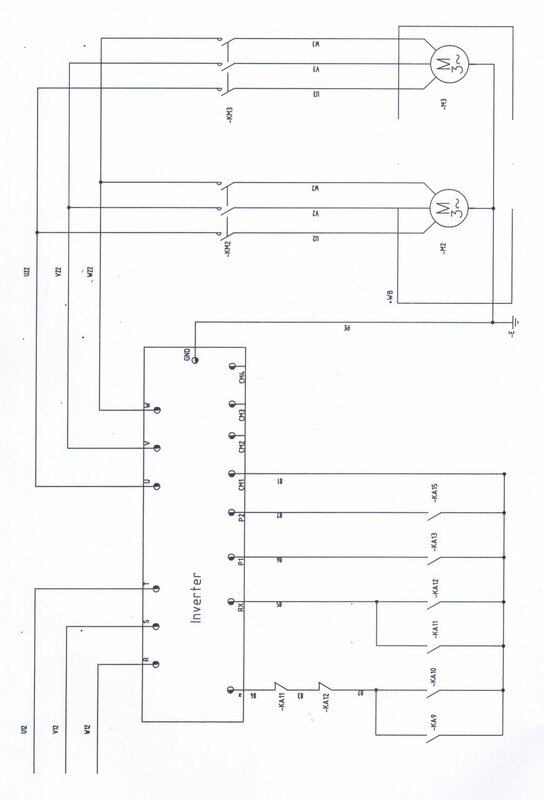 To start the main motor running and Control circuit. 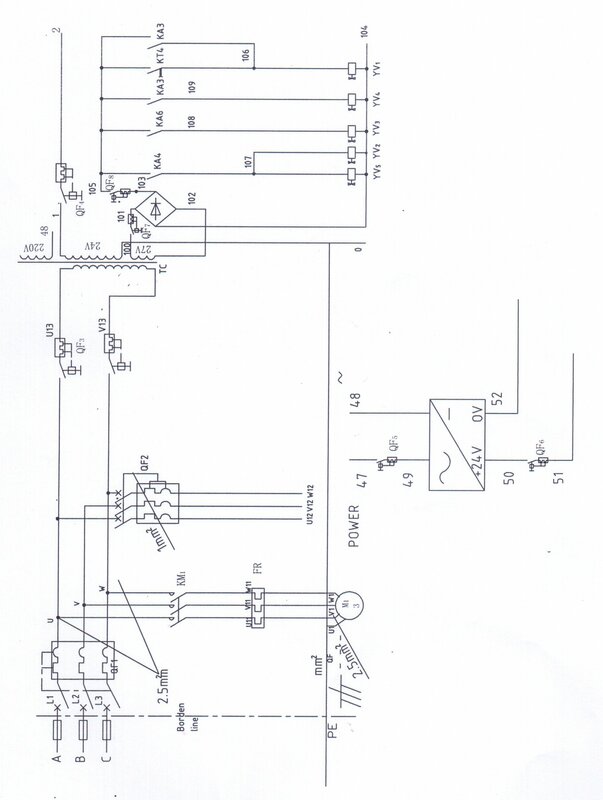 5.2 Stop button To stop the main motor running and Control circuit. In the Auto mode -The ram will rise automatically when Preset pressure is reached and the dwell time is up. In the Manual mode -Lowering and rising of the ram is by pressing the foot pedal. 5.4 Foot pedal Push and hold to command lowering the ram to reach bending point, release when the ram is moving up in AUTO mode. Press to command lowering the ram and press to command raising the ram in Manual mode. The guideways are cleaned and greased. The hydraulic system is checked for any leakage. Check the oil level at the level gauge at the side of the tank with the top ram in the all up position. Top-up the oil is necessary. Check the sense of rotation of the motor by checking that the cooling fan is turning in a clockwise direction or, in any case, in the direction of the arrow. If this is not the case, invert two wires in the supply line. When doing this, it is important that the motor is made to work by inching. Turn on the main switch. Switch the selector to auto. Turn on the main motor by pressing the green button. Descend the ram by pressing the down pedal to make the top tool close to the V-die as possible. 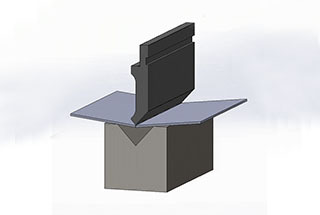 The upper tool and the selected V – opening must be aligned before any bending commences to ensure a good bending result. 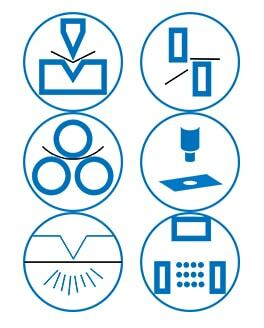 Ensure that the V-die base and table surfaces are clean before the following steps are carrying out. Lower down the system pressure by turning the pressure – regulating knob anti-clockwise. Set the mechanical depth stop to low position either manually or electrically. Select MANUAL MODE and step the down pedal to lower the ram until the top tool is as near to the V-die as possible. 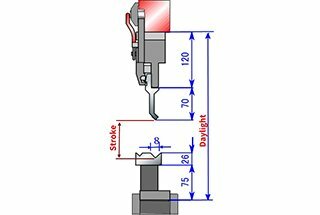 Align the upper and lower tool by adjusting the V-die tightening bolt. Once the setting is correct, secure all the V-die tightening bolts. Raise the ram by stepping on the UP pedal. To check regularly the fixing bolts of the tool clamp. To store the tool on a rack near the press brake. In this way, it will prevent the top tool against damage. Always remember that each tool has a maximum charge force. Turn the mode selector to manual. Lower the ram as near to the V-die as possible. Loosen all the fixing bolts of the tool clamp. Remove the tool from the side of the machine. Mount the new top tool by sliding it in from the same side. Tighten all the fixing bolts of the tool clamp. Turn the machine on and check that the mode selector is on manual. Lower the ram to make the top tool sit in the V-die. When doing this reduces the system pressure by turning the pressure regulating knob anti-clockwise so as to avoid damaging the tool. Free the V-die by unscrewing all the tightening bolts. Hook on the V-die to the ram at both end with the appropriate chain. Raise the ram by stepping the UP pedal to a height where the V-die can turn. Turn the desired Vee facing up. Lower the ram by stepping the DOWN pedal so that the die is resting on the machine table and to the point that the chains can be unhooked. Center the Vee with respect to the top tool. 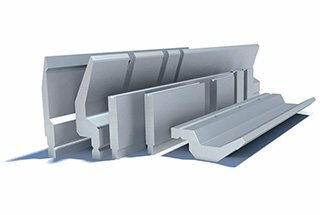 The press brake is supplied with two front support arms as standard equipment. These are used for placing the plate on during the various bending phases. 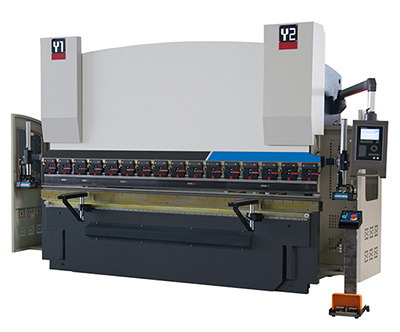 They can be adjusted vertically and along the length of the press brake. The support arms generally need to be adjusted when a different size bottom tool is used or a larger or smaller size plate is being bent. IF THE PUNCH AND DIE ARE NOT PLACED CORRECTLY, YOU MUST NOT START THE MACHINE, ANY TIME, DON’T PULL YOUR HANDS OR ANY PARTS OF BODY INTO THE SPACE BETWEEN PUNCH AND DIE, IT IS VERY DANGEROUS! DO NOT ATTEMPT TO ADJUST THE MECHANICAL DEPTH STOP SETTING WHEN THE RAM IS AT THE DOWN POSITION AS THIS MAY CAUSE UNNECESSARY DAMAGE TO THE MACHINE. The depth setting determines the bending angle. The mechanical depth stop could be set either manually or electrically. 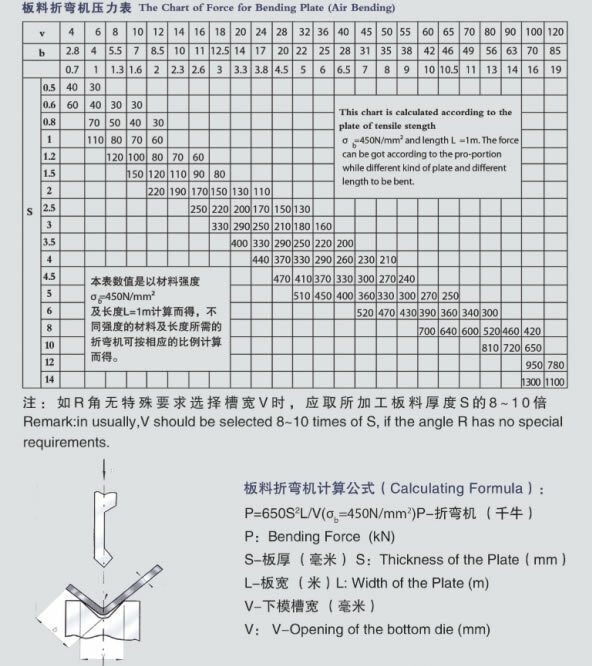 The required bending force can be calculated from Table 1 formulate. 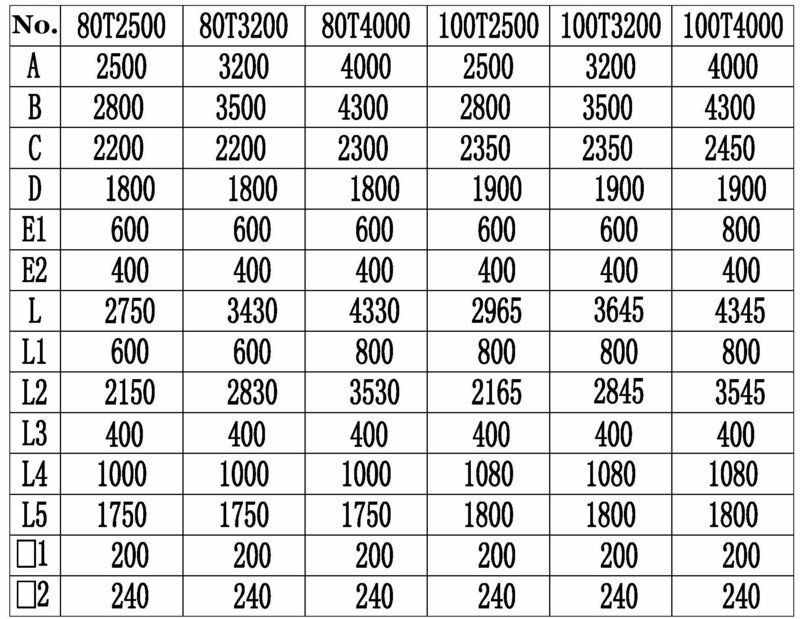 Note: This formula and the values in the table are all based on carbon-steel plates with tensile strength Qb=450KN. You can also calculate press brake bending force by our tonnage calculate specially designed for press brake. Repeat the above procedure until the required accuracy is reached. Check that Emergency Stop is release. Check foot pedal cable for the possible broken wire. Check that motor rotation incorrect. Check that micro-switch inside foot pedal is working. Worn off upper tool or lower tool. Machine table surface and the underside of the V-die is dirty. Top and bottom tools not properly aligned. Any persons who operate and maintain this press brake must carefully read and comprehend this manual. Only the instructions are strictly followed can the satisfying effect be achieved. Special persons must be assigned to this machine, and the operators must be familiar with the use of the machine and the knowledge of safety in production. 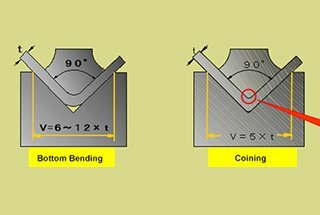 The bending force of workpiece must not be more than nominal force. 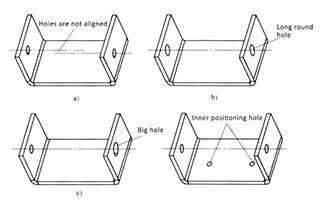 To make molds wear well, do not damage the molds due to inappropriate bending width, especially when bending narrow sheets, the working pressure should be reduced properly. As for each length 630mm, the bending load should not be over 400KN. The bending sheets should be in the middle of the machine and should not be partially loaded. Meanwhile, the machine must not be unilaterally loaded so as to avoid the precision of work pieces and the machine. 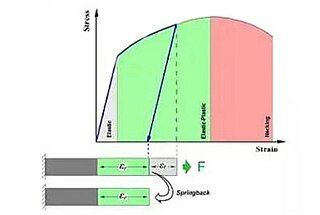 If a workpiece should be worked out on the single side, the load should not be more than a quarter of the nominal force. The bending should be on both sides. The hydraulic oil in oil tank must be changed after using for the first month, and afterward, it must be changed in less than a year. 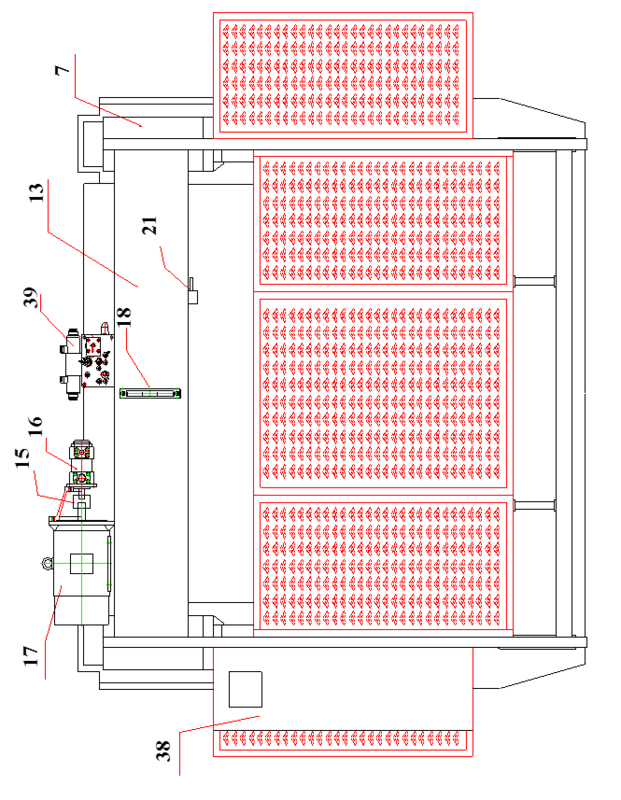 The normal working oil tank should be at 15-60℃ (if the temperature is too high, the cooler must be equipped). This press brake machine is applicable for scattered lubrication and lubrication should be carried out according to working conditions and all the lubrication points. User must keep ready accessories for maintenance from time to time. The precision of this machine after heavy repair must be up to the factory standards. Check regularly the oil level in the tank. First oil change after 500 working hours. Subsequent oil change at every 2000 working hour. Always use oil meeting the characteristics of the oil type mentioned. 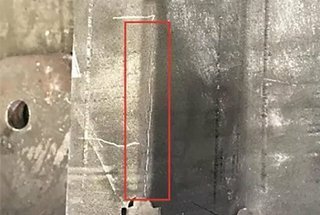 If the working pressure and temperature of the hydraulic system are higher, and the working speed is slower, the chose hydraulic oil mark is higher. It is also recommended not to use the machine at very low temperatures (below -5℃). However, should this occur, and then let the machine run idle for a while. An oil heater can be fitted in the circuit if required. Under the normal working conditions, the oil temperature must not exceed 70℃. Under special conditions, oil cooler can be fitted necessary. It is recommended to use antiwar hydraulic oil ISO VG46# (the average value of viscosity is46mm2/s, when the temperature is 40℃). If the machine operates under 5℃ for a long period, you can choose hydraulic oil ISO VG32#. Regularly clean the oil filter by rinsing and brushing in a solvent. The oil filter should be changed when cleaning is not possible or damage. Use the same grade of oil filter when replacement is necessary. The number of lubrication points is reduced to a minimum and easy to reach. Lubricate weekly with good grease. Regularly check all connections in the main panel and the electrical switches. If necessary tighten the screws. Replace defect fuse and signal light. —The section is used in the press brake machine with special demands, it is only referenced to other machines. For ensure the safety of people and equipment, we design the safety equipment. The operator must not change, remove or discharge the safety equipment. There is a light beam or laser (according to customer’s request), If the operator wards off the light curtain, the safety module will work. The ram cannot move downward. To avoid the operator injured. There is safety grid at side and back of the machine. It can keep the operator away from dangerous areas. Safety grid connects electrical system by the safety switch. 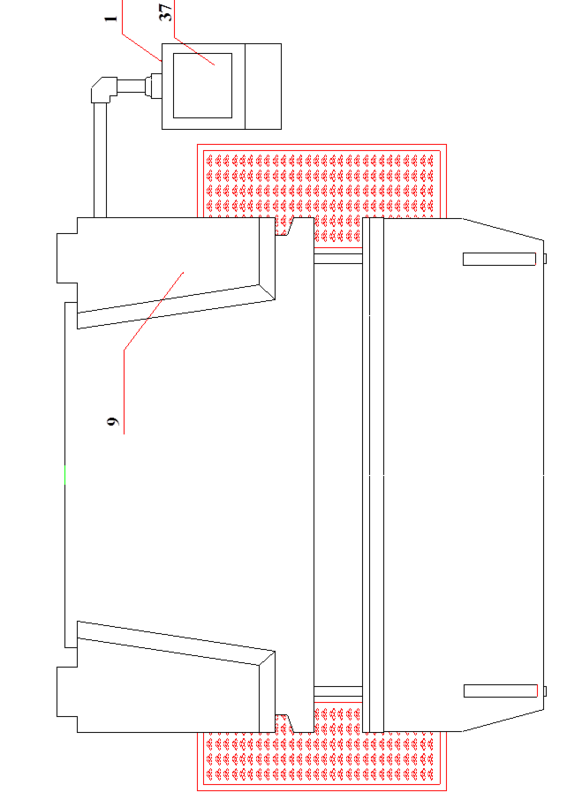 When opens the safety grid, the electrical system starts, the machine cannot operate. There is an emergency stop button on the handle control station, hanging control station. When there happens error operation or other accidents, push the emergency stop button, the machine will stop all actions. Ram’s falling is very dangerous. To avoid its falling, the system adds the safety lifting valve. 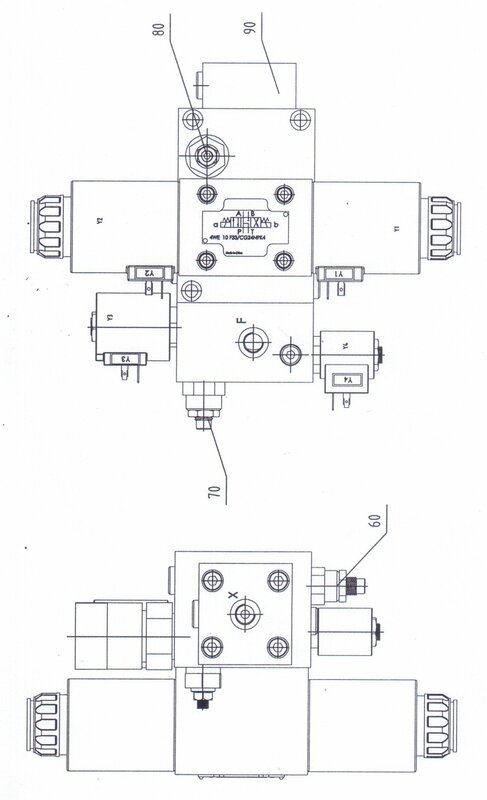 The valve cores of exchanging valve and safety lifting valve have checking signal. 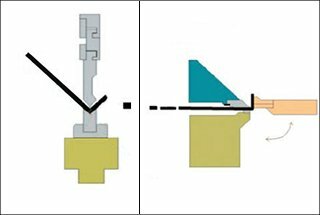 If the valve core is abnormal, the checking signal will stop the electrical system to avoid the falling injury. If the valve cores of exchanging valve and safety lifting valve cannot reset, check the valve. The normal operation is safety. If it happens any strange accidents, or when you maintain or repair the machine, you lock in the safety grid, push the emergency stop button, which inside the uprights, then call for help. 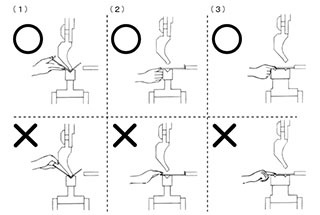 If your hands or other parts of the body are clamps by the punch or sheet, push the emergency button; check the condition then restarts the machine. Switch the operating mode to “inch” position. Then pushes the handle return button, the ram returns pull the clamped parts out.